Emilija Škarnulyte, Twin Øso, 2016. 2 channel video, Dolby surround sound. Ballroom Marfa presents Hyperobjects, a group exhibition co-organized by philosopher and Rice University professor Timothy Morton and Ballroom Marfa Director & Curator Laura Copelin, engaging ideas from Morton’s theory to confront the overwhelming scale of today’s ecological crisis. The opening reception is on Friday, April 13th. The exhibition features installations from the Center for Land Use Interpretation, Megan May Daalder, Tara Donovan, Nance Klehm, Postcommodity, Emilija Skarnulyte, and Sissel Marie Tonn with Jonathan Reus, as well as objects and loans from David Brooks, the Center for Big Bend Studies, Rafa Esparza, Raviv Ganchrow, Paul Johnson, Candice Lin, the Long Now Foundation, Iván Navarro, the A. Michael Powell Herbarium, the Rio Grande Research Center, Oscar Santillán, and the University of Texas at Austin McDonald Observatory. In his 2013 book, Hyperobjects: Philosophy and Ecology After the End of the World, Morton defines hyperobjects as entities that are bewilderingly huge—global warming, plastic in the ocean, nuclear waste—and seemingly incomprehensible. Morton argues that hyperobjects create an ecological awareness far beyond normal human comprehension. To understand a hyperobject, we must transform the way we see and experience the universe. In line with this idea, the exhibition seeks to create encounters with artworks and non-art objects that de-center and expand the scale of human perception. Via aesthetics, direct sensory experience, speculative explorations, and dramatic fluctuations in scale, the artists in Hyperobjects reflect various facets of this monumental theory. 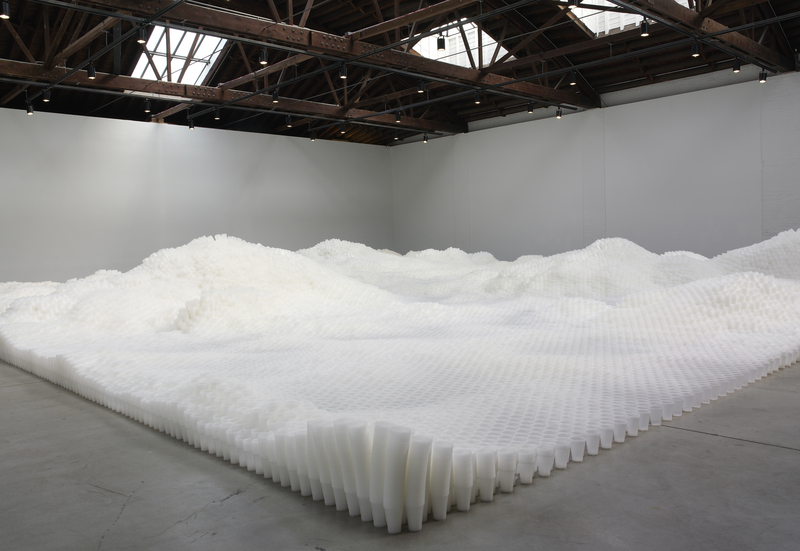 To this end, Tara Donovan realizes a site-specific iteration of Untitled (Plastic Cups), where she applies sculptural process to the fundamental properties of an object, in this case a plastic cup, at a scale that transforms the cup into something else entirely. Emilija Skarnulyte’s immersive video installation depicts neutrino detectors and nuclear submarines from the perspective of an anthropologist from the distant future. Megan May Daalder’s Mirrorbox is a wearable double helmet invented by the artist to reflect and combine the facial features of participants, breaking down perceived boundaries between self and other. 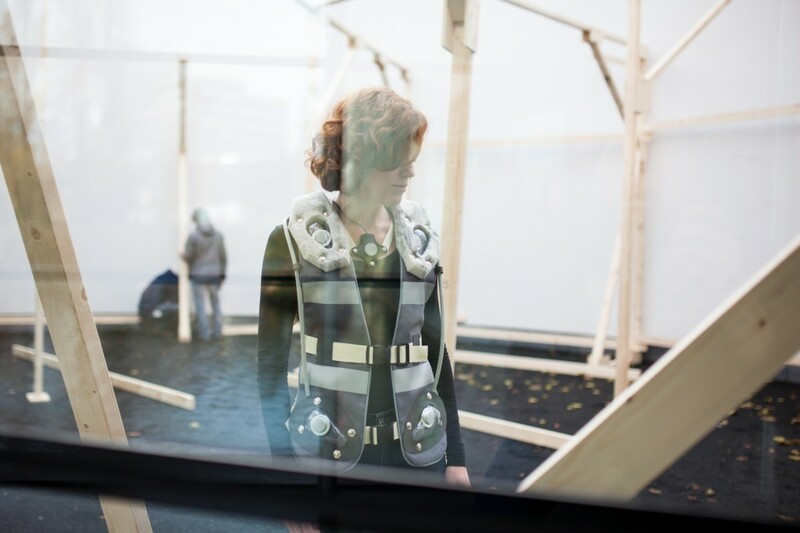 Sissel Marie Tonn installs a new configuration of her Intimate Earthquake Archive, allowing visitors to wear vests that transmit seismic data from man-made earthquakes caused by gas drilling. Nance Klehm digs holes in Ballroom’s courtyard: burrowing, creating heaps, analyzing soil, cataloging detritus, and giving visitors an opportunity to be physically immersed in earth. The artist collective Postcommodity considers the US/Mexico border with a sound installation that dramatizes the government’s co-opting of myth, language, and voice to entrap migrants moving across the landscape. Dedicated to understanding human interactions with the land’s surface in the USA, the Center for Land Use Interpretation (CLUI) researches and maps phenomena across the West Texas landscape. Copelin and Morton have also included objects sourced from the botanical, geological and anthropological records local to Marfa and the Trans-Pecos region, loaned by academic partners at the University of Texas at Austin and multiple departments at Sul Ross State University including: the Center for Big Bend Studies, Rio Grande Research Center, and the A. Michael Powell Herbarium. 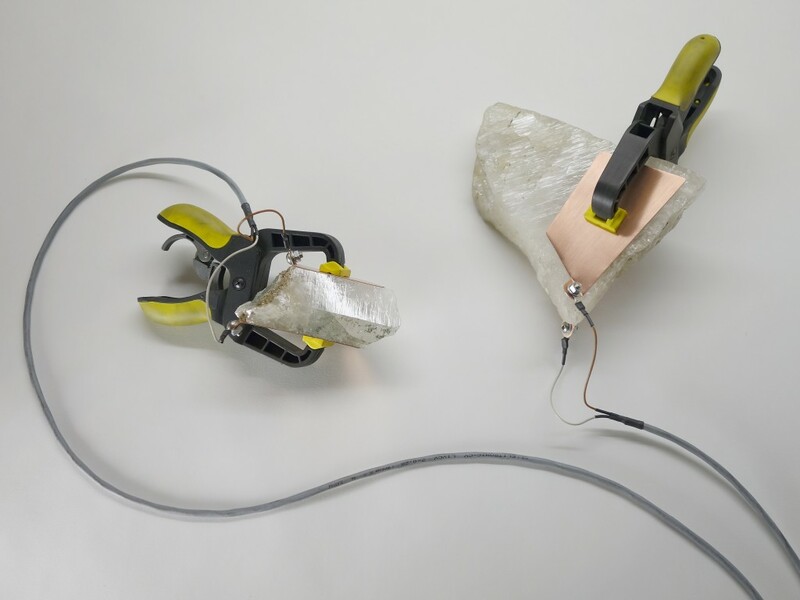 Distributed among these specimens and artifacts are artworks and objects from David Brooks, Rafa Esparza, Raviv Ganchrow, Paul Johnson, Candice Lin, the Long Now Foundation, Iván Navarro, and Oscar Santillán. 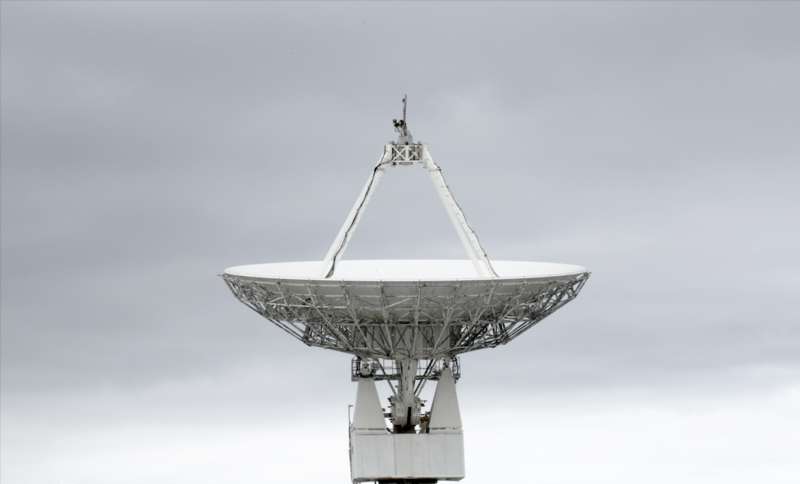 Ballroom Marfa is collaborating with local, regional, and national research organizations on a slate of supplementary programs that respond to the exhibition and connect participants to the singular ecology of the Trans-Pecos. Project partners include the Borderlands Research Institute, Rice University’s Center for Energy & Environmental Research in the Human Sciences, and The Nature Conservancy. A catalogue, produced in conjunction with the exhibition, will include contributions from Olafur Eliasson, Kathelin Gray, Morton, Ben Rivers, Kim Stanley Robinson, Mark von Schlegell, the artists in the exhibition, and more to be announced. Timothy Morton is Rita Shea Guffey Chair in English at Rice University. He gave the Wellek Lectures in Theory in 2014 and has collaborated with Björk, Haim Steinbach and Olafur Eliasson. He is the author of Hyperobjects: Philosophy and Ecology after the End of the World (Minnesota, 2013), Humankind: Solidarity with Non-Human People (MIT, 2017), Dark Ecology: For a Logic of Future Coexistence (Columbia, 2016), forthcoming Being Ecological (Penguin, 2018), eighteen other books and over 200 essays on philosophy, ecology, literature, music, art, architecture, design and food. He blogs regularly at ecologywithoutnature.blogspot.com. Photo by Megan Daalder. Courtesy the artist and Ballroom Marfa. Photo by Sissel Marie Tonn. Courtesy the artist and Ballroom Marfa. Photo by Raviv Ganchrow. Courtesy the artist and Ballroom Marfa.